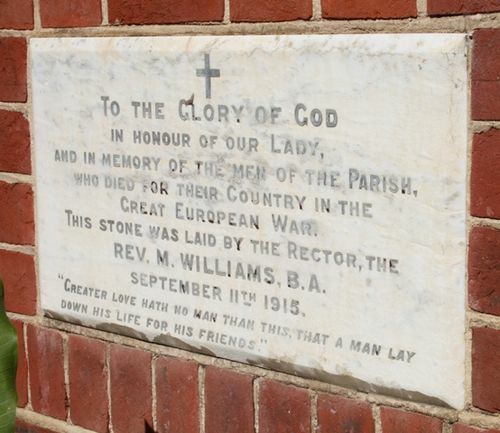 The foundation stone of the Lady Chapel commemorates the men of the St Pauls Parish who died in service or were killed in action during World War One. On Saturday afternoon the ceremony of laying the foundation stone of the Lady Chapel in connection with St. Paul's Church at Port Adelaide, was performed by the Rector (Rev.M. Williams, B.A.). There was a large attendance and the visiting clergy present were the Revs. Canon Wise, W.G. Marsh, F. W. Wilkinson, C.F. Hall, and C. J. Whitfield. There was a procession from the sanctuary and Chancel of St. Paul's to the site, which adjoins the church. The Lady Chapel is part of the original design of the building. The foundation stone bore the following inscription:— "To the glory of God, in honour of our Lady and in memory of the men of the parish who died for their country in the great European War. This stone was laid by the Rector, Rev. M. Williams B.A., September 11, 1915. Greater love hath no man than this, that a man lay down his life for his friends." The Register (Adelaide), 13 September 1915. In honour of our Lady, and in memory of the men of the Parish, who died for their country in the Great European War. This stone was laid by the Rector, the Rev. M. Williams, B.A. September 11th 1915.